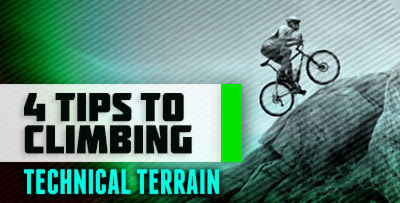 Tackling a technical climb can bring trail flow to a halt. follow these 4 tips to keep your hill charge going. 1. Roll: On technical climbs, provide extra power just before clearing obstacles, momentum keeps you from getting snagged and stalling out. 2. Lift: As you approach an obstacle, give your forward pedal a stab and slightly to pull the wheel into the air and onto the obstacle. As the front wheel hits, stand on the pedals as you push the bike forward with your hips and hands. 3. Groove: Position your weight on the rear tire so it doesn't spin out while keeping enough weight on the front that it doesn't wander. Move forward on the saddle and drop your torso closer to the bar. This will let you keep pushing the pedals and still shift your weight. 4. Starting Over: So you put a foot down, and now you're trying to get going again. 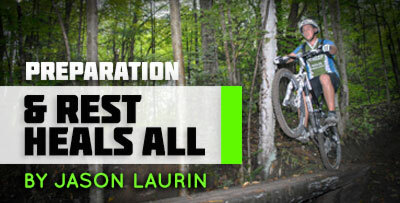 Without changing gears, point the bike up the trail, sit on the saddle, clip one foot in and go for it. Don't start from standing, if you're standing, there's a good chance you'll just spin out. When we think of working out, exercising, training...whatever you want to call it, we typically think of our contribution or our “output” to complete the task at hand. We usually gauge how effective the exercise was by how exhausted and sore we are the next 24 – 48 hours. But, how do we know exactly what happened within our body? Was it productive? Are we getting stronger because of it? Are we increasing our stamina?....Without proper rest and recovery we will not increase performance, feel healthy, energetic or even lose unwanted fat. In order to be conducive to achieving our goals we need to ensure we have a “balance” of rest to benefit from our workouts. If we fail to give our bodies this time to recover, we risk the possibility of “over training”, and contrary to what you believe is proper rest periods, you would be surprised as to how much we really need. It doesn’t matter how fit you are, exercise is stress on the body and our bodies need to constantly replenish energy stores, heal tissues, and prepare for the next bout. There is short term and long term recovery. In this blog I will concentrate on the long term. Long term recovery would be considered essential for athletes with specific “competition” seasons. A good way to get that recovery/rest time is to break up your style of training, often referred to “Periodization”. This method involves tiering your workouts to build on a balance of endurance, strength and sport specific exercises with changes in intensity throughout the year. For example: Getting ready for “the season”, during the “season”, and after the “season” should be composed of different styles of training. In particular, they should be tiered to have the athlete peak in his/her time of competition. For our application of biking in the months of primarily May-September we would have a lighter training schedule during those 5 months and include cross-training exercises to keep us active. But leading up to the month of May (February and March), a training regime consisting of endurance and hill preparation would be ideal. And, after the season a rest period of a week or two would give your body ample time to recover and would lead you into a “re-building” or “foundation” training workout which would be “October and November. “Strength” training would be best to concentrate on peaking 6-8 weeks prior to “competition” months Ie. November –January. In between these training “modules” a week off would be appropriate to recover and prepare your body for the next change. Therefore, if you use these “weeks off” we are looking at a 6-8 weeks of NO training. Now, you can still be active. Walking, golfing, leisure biking etc will not put the stress on your body like our 2-3 hour treks in Copeland, weight training in the gym, or 3-5 hours at Joyride. While training, it is advised to limit your weight training to 45min max. Cardio can be performed same day or alternate days of weight training, although IMPO I find that the one day weights, one day cardio works best to minimize over training and maximize time spent on training. I also believe in taking at least 1 full day off of all training. Example: Mon, Wed and Fri weights...Tues and Thurs cardio and weekends off for a walk with the dog or a bike ride. I hope this gives everyone an idea of what our bodies can handle while exercising a little better. So, in closing, while we bike Copeland every Tuesday with the season upon us shortly, it is a good idea to have at least a day off of any exercise after Tuesday nights and if you are going to go for another intense ride the same week make sure you get ample sleep and give yourself a day in between your workouts to be best prepared for a kickass ride and minimize injury and overtraining.